In the revolving door of economic ideas, the old can be suddenly new again. Independent Senator Nick Xenophon resurrected one such idea this week. He said the Reserve Bank of Australia should replace its inflation target of 2-3% per annum with a target of nominal GDP growth of around 5.5% per annum. One big problem with Xenophon’s idea is that the theory does not fit the times. It is not the right policy for today. Energy prices are not going up; they have been falling and are now flat. Yes, electricity prices have been going through the roof in South Australia and to a lesser extent elsewhere. But oil prices have been falling or flat over recent years, and this has a more pervasive effect than government bungling of the electricity market. So output growth and inflation are not moving in opposite directions – both have fallen in recent years. Inflation is now below the bottom of the RBA’s target zone of 2-3% on any of the alternative measures. The RBA, along with most central banks of advanced countries, would actually like to see more inflation, not less. Annual output growth is struggling to reach 3%, which is below the long run average of 3.5%. Hence nominal GDP growth is below the 5.5% long-run average that Xenophon would target. So whether the RBA targets inflation or nominal GDP growth doesn’t matter – the policy would be the same – that is, stimulate spending by lowering interest rates, which is exactly what it has been doing. Why does The Conversation think NGDP targeting is only useful when (real) growth and inflation are moving in opposite directions? That is, when the economy is buffeted by a supply shock. 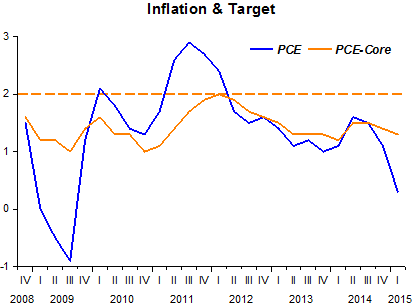 Inflation targeting entices the wrong policy from the central bank, “instructing” it to tighten. NGDP targeting “instructs” the central bank to “ignore it” – good move. But, more generally, NGDP targeting (in fact NGDP LEVEL Targeting) is the appropriate framework for “all seasons”. In addition to keeping the central bank from mishandling supply shocks, it keeps the central bank from generating demand shocks, which throws both inflation and real growth in the same direction, up as during the “Great Inflation” and down as in the “Great Recession”. The last highlighted sentence from The Conversation is just confirmation that what is required is a LEVEL target. For example, if the central bank adopted a Price Level Target it would not be in the “low inflation-low real growth” it is in today. The downside of PLT is that just as in the case of IT, the central bank would be tricked into taking the wrong action when the economy is hit by supply shocks. Another downside is that although nominal GDP growth would be more stable, inflation would tend to be more volatile. Inflation could jump up and down, but as long as output growth moved in the opposite direction the RBA would do nothing to dampen the volatility in inflation. Volatile inflation increases the uncertainty about future prices, which inhibits investment spending by firms and households. How does someone who starts a business – taking out a loan and hiring staff – in expectation of 7 per cent a year growth in nominal spending deal with a sudden drop in spending to 2 per cent? Not well, I reckon. The Fed wastes time “star trekking”! 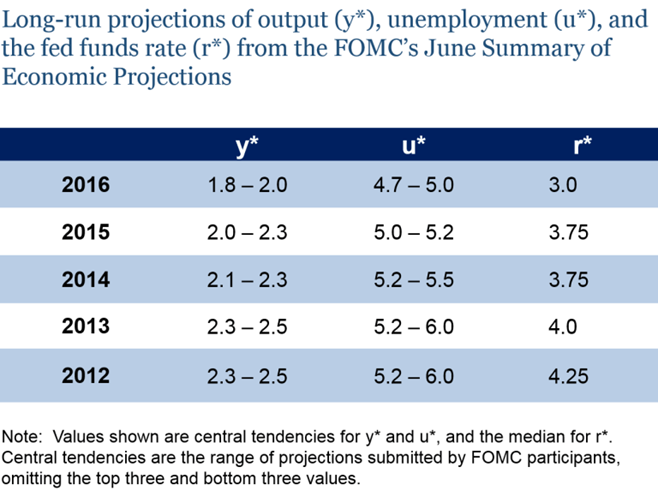 FOMC communications also have been affected by the recent revisions in the Fed’s thinking. It has not been lost on Fed policymakers that the world looks significantly different in some ways than they thought just a few years ago, and that the degree of uncertainty about how the economy and policy will evolve may now be unusually high. Fed communications have therefore taken on a more agnostic tone recently. For example, President Bullard of the St. Louis Fed has recently proposed a framework which implies that, in most circumstances, economic forecasters can do no better than to assume that tomorrow’s economy will look like today’s. Other participants, noting earlier failures of forecasting, have argued that (for example) policy should not react until inflation has actually risen in a sustainable way, as opposed to being only forecast to rise. In general, with policymakers sounding more agnostic and increasingly disinclined to provide clear guidance, Fed-watchers will see less benefit in parsing statements and speeches and more from paying close attention to the incoming data. To argue that you should all but ignore the Fed is certainly very confusing! We were fortunate enough to have Nancy Lazar, from Cornerstone Macro, in our office today and she emphasized a very important point: nominal GDP is ultimately what really matters. Nominal growth is what drives corporate revenue, and in turn, drives business spending. Because businesses are the backbone of any economy, trends in nominal GDP greatly impact inflation, wage growth, consumer spending, capex and interest rates to name just a few macro economic variables. When the first release of 2Q GDP came out in late July, we noted how the 10-year annualized change in GDP had fallen to just 2.94%, which is the lowest growth rate on record going back to 1957. In the subsequent charts below we see how this structural decline in nominal GDP is reverberating through other parts of the economy. There´s a better way to see the importance of nominal stability – the appropriate level and growth rate of nominal GDP (NGDP). 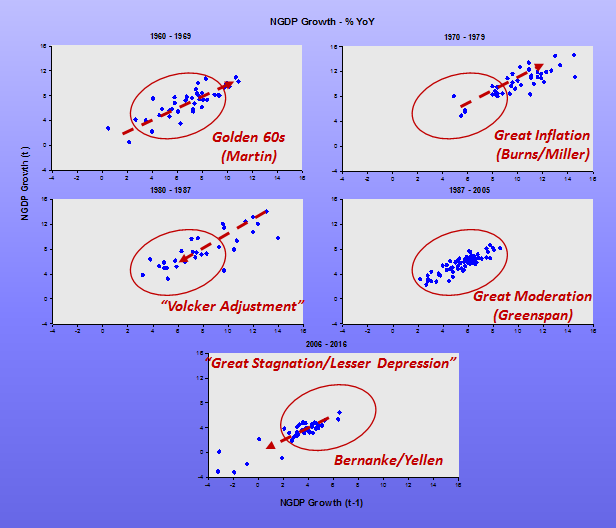 In the panel below, which charts NGDP growth at time t against growth at time t+1, we see that what came to be called “Great Moderation”, characterized by stable real growth and stable and low inflation, was a period in which NGDP growth was stable and evolving along a stable trend level path. 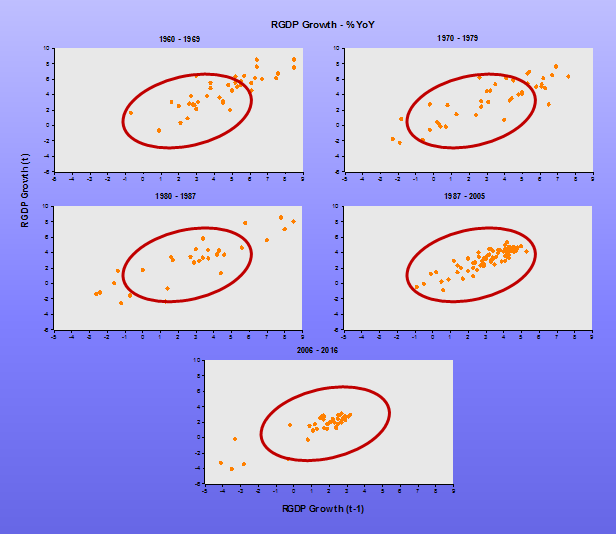 During the “Great Inflation” we see that NGDP growth was excessive and upward trending. 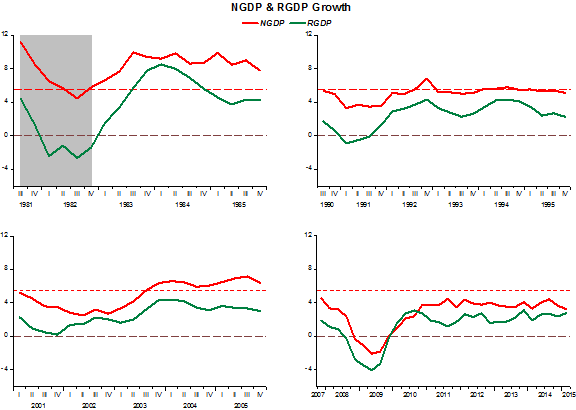 At present (“Great Stagnation”), after trending down, NGDP growth has once again come back into the “stability circle”. 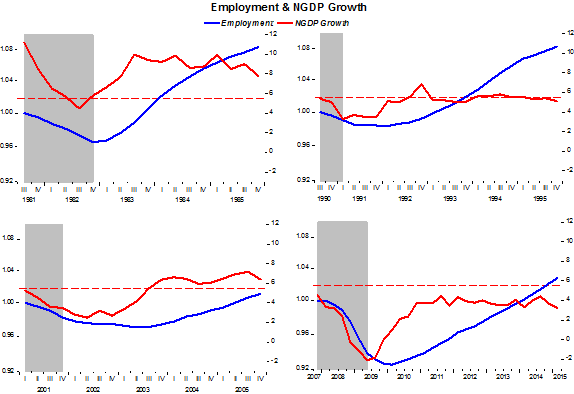 However, NGDP growth is “too low” and is evolving along a trend path that is also too low. 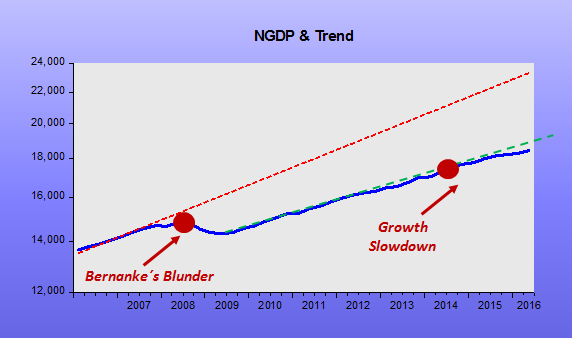 In fact, as the chart below indicates, it appears that since 2014 NGDP growth is even veering off from this lower path. No surprise, then, that “Fed communications have taken on a more agnostic tone”. As Bernanke argues: “It has not been lost on Fed policymakers that the world looks significantly different in some ways than they thought just a few years ago.” And what´s different is of Bernanke´s own making when, as Fed Chairman, he let NGDP (something which the Fed can closely control, in contrast to the “star variables”) drop significantly. But since they don´t know “what´s different”, stay tuned for more Fed mistakes going forward! The latest attempt comes from Neel Kashkari (the new “NK” at the Minnesota Fed, the previous one being Narayana Kocherlakota). keep the machine well oiled, to continue Mill’s analogy. Accomplishing the first task [avoid monetary disorder] will contribute to this objective, but there is more to it than that. Our economic system will work best when producers and consumers, employers and employees, can proceed with full confidence that the average level of prices will behave in a known way in the future-preferably that it will be highly stable. Under any conceivable institutional arrangements, and certainly under those that now prevail in the United States, there is only a limited amount of flexibility in prices and wages. We need to conserve this flexibility to achieve changes in relative prices and wages that are required to adjust to dynamic changes in tastes and technology. We should not dissipate it simply to achieve changes in the absolute level of prices that serve no economic function. Ensuring that inflation remains low and stable allows households and businesses to plan ahead and keeps borrowing costs low. Thus, by doing its inflation-stabilization job well over the long run, a central bank helps create the environment that allows an economy to flourish. We saw the damage caused to Main Street in the 1970s when the Fed failed to control inflation. It took bold action by the Volcker Fed to regain control and put the economy back on a stable course. If, as I’ve claimed, changes in the general level of prices are an economy’s way of coping, however imperfectly, with monetary shortages and surpluses, then surely an economy in which the price level remains constant, or roughly so, must be one in which such surpluses and shortages aren’t occurring. Right? No, actually. Despite everything I’ve said here, monetary order, instead of going hand-in-hand with a stable level of prices or rate of inflation, is sometimes best achieved by tolerating price level or inflation rate changes. A paradox? Not really. But as this post is already too long, I must put off explaining why until next time. Anyway, market monetarists eschew associating “stable monetary background/environment” with “stable average level of prices or inflation” preferring to associate it with the more encompassing “nominal stability”, by which we mean stable NGDP growth (along a defined level path). 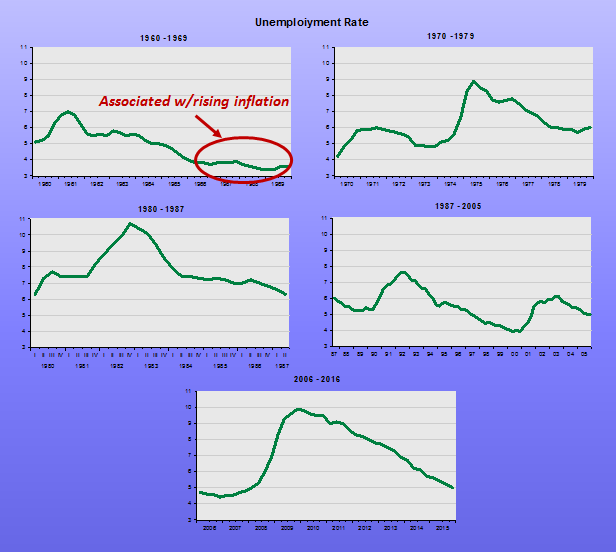 The charts below, I believe, provide compelling evidence for requiring the central bank to provide nominal stability. As the Great Moderation shows, a period of nominal stability goes hand in hand with stable (and close to potential) real growth, low and stable inflation and “low” rate of unemployment. The inflation panel is clear. Having low and stable inflation, as is true now as it was in 1994-05, does not equate with nominal stability! Krugman´s answer to DeLong: We´re in a “Postmodern Economy”! One more thing: Brad says that we came into the crisis expecting business cycles and possible liquidity-trap phases to be short. What do you mean we, white man? Again, we had the example of Japan — and even aside from Rheinhart-Rogoff, it was obvious that Postmodern business cycles were different, with prolonged jobless recoveries. In the end, while the post-2008 slump has gone on much longer than even I expected (thanks in part to terrible fiscal policy), and the downward stickiness of wages and prices has been more marked than I imagined, overall the model those of us who paid attention to Japan deployed has done pretty well — and it’s kind of shocking how few of those who got everything wrong are willing to learn from their failure and our success. By calling this a “postmodern” recession, Krugman is likely saying that the only way-out is through fiscal policy. But that has been tried (according to Krugman the dosage was not big enough) and the collateral effects have been pretty damning. What all this discussion does is to allow the Fed to stay on the sidelines. After all, it had not much to do with anything that´s been happening. It´s “Postmodern”! Let´s put up some images. The first set shows that the both the intensity of the drop in employment and the speed of increase are associated with what happens to aggregate nominal spending (NGDP), something the Fed closely controls, irrespective of where the interest rate happens to be. Note that things are much more subdued after the Volcker adjustment phase (1981-85). What follows is the “Great Moderation”, when NGDP grows at around 5.5% along a stable level trend. The present cycle is another animal altogether. The Fed never had its heart in pulling nominal spending up to a reasonable level, keeping its growth stable at “slow speed”. Employment takes a deep dive and comes back at a speed consistent with the low spending growth. 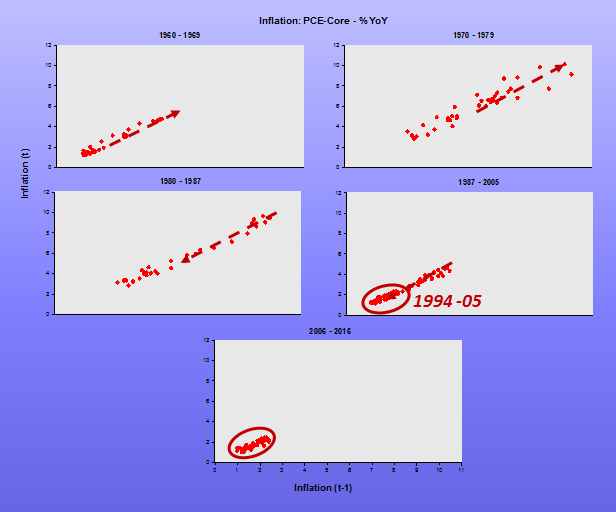 The next set shows the behavior of inflation over the same periods. The pattern is easy to see. The Volcker adjustment is successful in bringing inflation down. Later, Greenspan places it on (or close to) the 2% “target”, mostly by keeping spending growth close to the trend level path. Then, Bernanke comes along and apparently decides that´s “way too high”. To keep inflation “lower than low” the Fed pulls the hand brake to slowdown nominal spending growth. 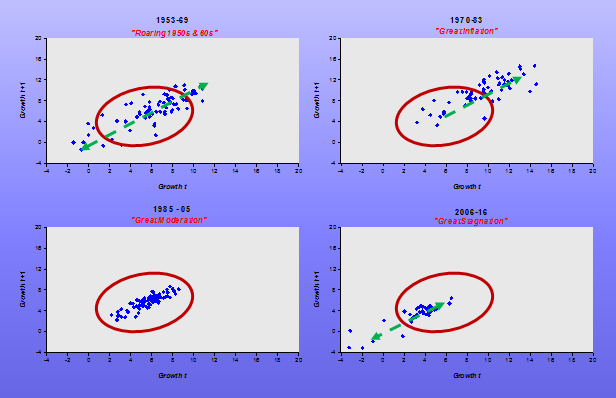 The last set illustrates nominal and real growth over the episodes. When you look at the bottom right image, you get the hang of why thinks are so glum. The “novelty” of the situation depicted in the bottom right image of all the charts is what explains why people’s expectations of the length of the what Krugman calls the “liquidity-trap” phase were “miles off”, and why DeLong says “backward induction unraveled”. Unfortunately, very few fingers point at the Fed! From Yellen´s most recent speech, it is clear that these “doctors” are not worth their pay. They are only concerned with prescribing a placebo (FFT)! Maybe it´s harder to provide nominal stability at an appropriate level (“dose”). And we know that “prescription” is good because it has done wonders for the patient in the past! But Yellen expressed confidence that the recovery remains intact — even if it is not as robust as Fed officials themselves once thought. And that would be enough for the Fed to begin reversing nearly a decade of easy money. From the charts below, it appears that if they want to play around varying the “dosage” of placebo as they were used to, they first have to get the “patient level of stamina UP”! …This is why we shouldn’t place much weight on the official measures of real GDP growth. It is relatively easy to add up the total dollars that are spent in the economy—the amount labeled nominal GDP. Calculating the growth of real GDP requires comparing the increase of nominal GDP to the increase in the price level. That is impossibly difficult. The basic idea is that inflation may be overstated, because it doesn’t do a good job of handling new products. As a result, real output growth may be a bit stronger than measured. Marty runs through a lot of sensible conclusions. He doesn’t talk about monetary policy, but that’s interesting too. So what if inflation really is (say) 3% lower than we think it is, and therefore real output growth is 3% larger than it really is? That would mean we are a lot closer to “normal” of course. It´s not Friedman´s Chicago any longer! It appears there will never be a R.I.P. for Inflation Targeting! The cardinal rule of central banking, in the United States and in most other industrial nations, is that annual inflation should run around 2 percent. But as the Federal Reserve prepares to start raising its benchmark interest rate later this year to keep future inflation from exceeding that pace, it is facing persistent questions about the wisdom of the rule and the possible benefits of significantly increasing its target. Higher inflation could disrupt economic activity, but it also would enhance the Fed’s power to stimulate the economy during recessions. And some experts say the struggles of the Fed and other central banks to provide enough stimulus since the Great Recession suggest they could use more room for maneuvering. IT has been “dead” for seven years but a “burial ceremony” is never planned! Instead, applying “CPR” is the “solution” most discussed. When “theory” placed inflation targeting at the “center” and interest rate targeting as the “mechanism” to accomplish it, they simultaneously took money out of the equation. Give IT the R.I.P. it deserves, and bring out “nominal stability” to centerfold. Money will naturally become the “accomplishing mechanism”. Yellen recognizes the dismal choices and strives to cultivate confidence as a way of blunting the conflicts. At her recent news conference, she emphasized that the Fed, though it wants the freedom to tighten policy, will not be hurried into premature or sharp rate increases. Even after the initial change, she said, “our policy is likely to remain highly accommodative.” Money will continue to be cheap. Investors need not make market-disruptive changes in their portfolios. I not only liked but also loved the “limited and tentative” description. I believe Samuelson´s question has a simple and straightforward answer. It happened when the Fed, after the change of guard from Greenspan to Bernanke, forsook nominal stability to pray at the altar of inflation targeting. U .S. monetary policy has been remarkably successful during Alan Greenspan’s 121/2 years as Federal Reserve chairman. But although President Clinton yesterday reappointed the 73-year-old Mr. Greenspan to a new term ending in 2004, the chairman will not be around forever. To ensure that monetary policy stays on track after Mr. Greenspan, the Fed should be thinking through its approach to monetary policy now. The Fed needs an approach that consolidates the gains of the Greenspan years and ensures that those successful policies will continue; even if future Fed chairmen are less skillful or less committed to price stability than Mr. Greenspan has been. We think the best bet lies in a framework known as inflation targeting, which has been employed with great success in recent years by most of the world’s biggest economies, except for Japan. 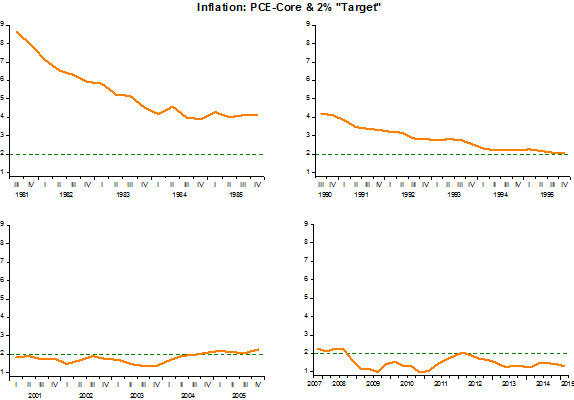 Inflation targeting is a monetary-policy framework that commits the central bank to a forward-looking pursuit of low inflation; the source of the Fed’s current great performance; but also promotes a more open and accountable policy-making process. More transparency and accountability would help keep the Fed on track, and a more open Fed would be good for financial markets and more consistent with our democratic political system. If Bernanke had only understood that Greenspan in practice had been (more or less) committed to nominal stability, understanding that real, or supply, shocks should be treated carefully, he wouldn´t have let nominal spending tank in 2008. Substantively, our results suggest that an important part of the effect of oil price shocks on the economy results not from the change in oil prices, per se, but from the resulting tightening of monetary policy. This finding may help to explain the apparently large effects of oil price changes found by Hamilton and many others. Bernanke mentions Japan as an exception to the success of inflation targeting. He missed an important lesson there because Japan was, in fact, the first victim of an “no holds barred” IT regime. To make a long story short, after the inflation explosion in Japan in the mid-1970s (when inflation reached 25%), inflation became Japan´s public enemy #1. An inflation target was never made explicit but every housewife in the land new that the BoJ pursued “price stability”. With that background, in 1989, when the Ministry of Finance introduced the first installment of the consumption tax, prices jumped. Immediately the BoJ clamped nominal spending. This was repeated after the second installment in 1997, with even more dire consequences! In short, Bernanke´s “best bet” was the wrong bet. Instead of “powerful and commanding” the Fed became “limited and tentative”. But the solution presents itself clearly. 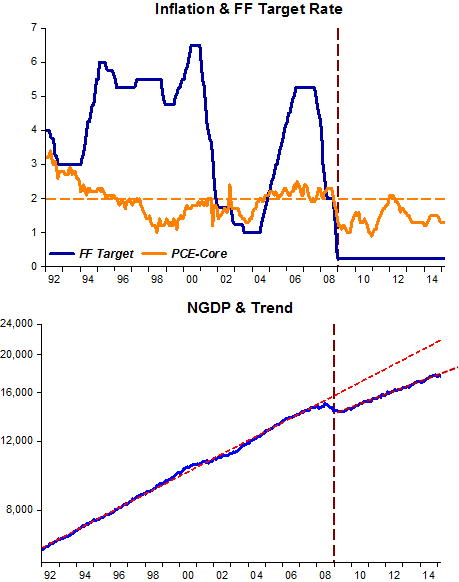 Have the Fed pursue an explicit NGDP Level Target. Very quickly it will once again become “powerful and commanding” and the “instrument rules” advocates like John Taylor will have to change their tune! More significantly still, Krugman´s “liquidity trap” meme will fade!